This deliverable item reports about the internationalization activities of RobotCub. Items in bold are the more recent additions. Please note that this is a cumulative document. Generically, with respect to internationalization and more in general dissemination, the RobotCub project has been quite active. Dissemination for RobotCub has the two-fold goal of forming a community of users and simultaneously in doing so to guarantee a "continuation" of the RobotCub idea beyon the end of the project. For Task 9.1, the iCub was on a live demo at IJCAI in Pasadena (CA) where many contacts with US companies (e.g. Barrett) and DARPA were made (DARPA has/had a program in Cognitive Systems and Robotics). In Task 9.2, we organized the so-called "winter school" for the Open Call winners (but also generically for all iCub owners) and the fourth edition of the "summer school" near Genoa. We had a record of "good" applications in 2009 and we had to be selective eventually accepting 38 participants working on two iCub's in parallel and one head (with the usual support from simulators). For Task 9.3 we organized four meetings which were attended by all partners. Most of the time was devoted to software/integration related activities in preparation of the final review meeting. Task 9.4 progressed steadily and although the main website did not evolve much, our "parallel" website http://www.icub.org has been growing considerably in content. Task 9.5 is the Open Call management. We have now completed the last robot of the Open Call (number 7), which is going to be delivered before the end of the project (some delay due to an unexpected debugging activity and the customs clearance for the US – which takes about four weeks). Task 9.6 continued as planned as IIT hosted several visits by partners for integration activities but also various visitors and other scientists interested in learning about the iCub. We also hosted a small workshop on software standardization inviting people from other projects (e.g. Paco+, the German Cotesys), companies (e.g. Willow Garage, US) and other research institutes (AIST Japan and the University of Tokyo). For Task 9.7, we progressed by seriously (i.e. with lawyers) evaluating various possible legal entities to manage the iCub IPR after the end of the project. Additional details are available on the progress report. Generic networking activity with euCognition, CogSys (now a conference), summer schools, personal contacts, etc. A report of the networking session can be found here. The RobotCub stand was shortlisted (best 10) for the ICT exhibition award. The two demonstrations in 2008 were at the Cogsys conference in Karlsruhe and at Automatica 2008 in Munich. In Munich, the EU Commissioner Viviane Reading visited our stand and could see the robot in a live demo. We believe that "live demonstrations" are good for dissemination but also to show to a wider audience that the technology of iCub is solid enough to allow research and long demonstrations without substantial failures. Special session on “cognitive architectures” at ICDL (Shanghai): Giorgio Metta, Tamim Asfour (Univ. of Karlsruhe) and Gordon Cheng (TU Munich) organized a special session at the International Conference on Development and Learning in Shanghai, China. Workshop on “cognitive vision” organized at IROS 2009 St. Louis: Giorgio Metta, Barbara Caputo (IDIAP Switzerland) and John Tsotsos (York Univ. Canada) organized a workshop on Cognitive Vision at the IROS conference (St. Louis, US). Giorgio Metta was also an invited speaker at a Autonomous Mental Development workshop at the same conference. Invited talks at: ICRA (workshop), IROS (workshop), IEEE-RAS Intl. Conference on Humanoid Robots (Workshop), Univ. of Southern Denmark (Odense), Univ. of Birmingham, CogX project Summer School (Stockholm), Microsoft Research (Redmond). On the role of embodiment in enactive behaviour (tentative title). Invited keynote lecture at the “Enactive 2008 Conference”, Pisa, November 2008. Self-organization, embodiment, and biologically inspired robotics. Invited keynote lecture. Darwin Days, Oslo, February 2009. Artificial Intelligence. Samstagsuniversität, Bern, February 2009. Embodied intelligence. Scuola Superiore Sant'Anna, Pisa, Italy, February 2009. Cognition -- the interaction of brain, body, and environment. Invited keynote lecture. Third International Conference on Cognitive Science, Tehran, March 2009. Embodied intelligence. FET 2009 Conference, Science Beyond Fiction, Prague, 2009. Embodied intelligence. Invited keynote lecture at the 20th Anniversary of AI in Japan, Nagoya University, October 2009. Self-organization, embodiment, and biologically inspired robotics. Keynote lecture, Lausanne, Switzerland, EPFL, Robotics Research Day, April 2009. The four messages of embodied intelligence. Swissnex Fifth Anniversary Celebration, Singapore, July 2009. The four messages of embodiment -- how the body shapes the way we think. Hosei University, Tokyo, October 2009. Verkörperte Intelligenz und die Menschenwerdung der Maschine. Invited lecture at Volkshochschule Zürich. December 2008. On embodied intelligence, bio-robotics, and human-centered machines. Invited lecture at Symposium on Robot Dreams. Kunstmuseum Graz, July 2009. Chrystopher L. Nehaniv, Invited Keynote Lecture at EU Commission Event Research Opportunities in FP7 ICT Challenge 2: Cognition, Language and other Interfaces and Robotics - Imperial College of Science & Technology, London, UK, 11 December 2008. This lecture showcased the iCub robot and related work of the Adaptive Systems Research Group work on EU projects RobotCub, LIREC, eCircus, IROMEC, and ITALK. We also took the opportunity to organize an ad-hoc live demo there of the RobotCub iCub robot in Prof. Murray Shanahan's lab there where an iCub had just arrived. Frank Broz, “The Role of Social Interaction in Developmental Robotics”, invited talk, Autonomous Mental Development for Intelligent Robots & Systems workshop, IROS 2009, St. Louis, Missouri, October 11, 2009. Frank Broz, AAAI - Spring Symposium 2010: It’s All in the Timing: Representing and Reasoning about Time in Interactive Behaviour workshop, Stanford University, Palo Alto, California, March 22–24, 2010. Robot Umanoidi ed esseri umani, Bressanone, Scuola Italiana di Bioingegneria, 26-Sep-06. We organized a special session including Giulio Sandini, David Vernon, Giorgio Metta and Hideki Kozima. Robotica e Neuroscienze, Genova, Festival della Scienza, 25-Oct-06. This is a science fair held annually in Genoa (Giulio Sandini). Robotics Platform Goals and Labs, Pisa, Meeting EUROP Mirror Group, 14-Feb-07 (Giulio Sandini). Humanoids, ICub and IIT, Tokyo, Primavera Italiana "Are Robots among us?" 23-Mar-07. A special event within an Italy-Japan program (Giulio Sandini). Intelligent and cognitive systems, Eze – France, International Cooperation Activities in Future and Emerging Information and Communication Technologies, 10-May-07 (Giorgio Metta and Giulio Sandini). Humans and Humanoids, Frankfurt, Honda Research Institute, 11-Sep-07 (Giulio Sandini). Cosy Summer School. Robots, neuroscience and artificial cognition, Berlin, Sept 2006 (Giorgio Metta). Workshop on Humanoid Technologies. Organized by Metta, Sandini, Cheng, Cannata at the IEEE-RAS Humanoid 2006 conference, Genoa, Dec 2006. Robot demonstrations, talks and promotion of RobotCub at IEEE International Symposium on Robot and Human Interactive Communication (RO-MAN) "Getting to Know Socially Intelligent Robots", 6-8 September 2006, University of Hertfordshire, Hatfield, United Kingdom. Organised RO-MAN06 The 15th IEEE International Symposium on Robot and Human Interactive Communication: “Getting to Know Socially Intelligent Robots”) at the University of Hertfordshire. This included a robot demonstration activity where UK press was invited (Chrystopher L. Nehaniv and Kerstin Dautenhahn). A journalist article was published on Nature (N. Nosengo. "Robotics: The bot that plays ball" Nature Vol 460, 1076-1078 (2009) doi:10.1038/4601076a). A partial list of press and media appearances include: Los Angeles Times, several Italian newspapers (e.g. La Repubblica), Le Figaro (France), Italian TV (Rai1, Canale5, Rai3). Suisse TV show Science Suisse. Die Intelligenz des Körpers. November 16th, 2008. Hjärnan i focus på spädbarnslabbet. Horisont Uppsala Universitet 2009. Hjärnan utvecklas i samspel med barnets handlande. (2009) Tvärsnitt 3:09. IIT hosted a small workshop on software standardization inviting people from other projects (e.g. Paco+, the German Cotesys), companies (e.g. Willow Garage, US) and other research institutes (AIST Japan and the University of Tokyo). The Open Call has been completed. At the moment of writing the first robot has been delivered. We have organized a Wiki page to start sharing information with the winners. The Open Call received 31 applications. 7 were selected for receiving an award iCub. We had to reduce the total number of awards to seven from the initially planned 8 robots. In fact, the last robot was eventually awarded only during the last period (M49-M65) of the project. We also built two more platform for the RobotCub partners. Procedure The RobotCub Open Call was launched on September 2007 with deadline for applicants on December 1st, 2007. The deadline was extended once by one week. The effective deadline of the call was December 7th, 5pm Brussels (Genoa) time. 31 proposals were received from UK, France, Germany, Spain, Italy, Sweden, Finland, Chile, Turkey, Romania, and USA. There were 7 non-EU proposals. We decided to award 6 robots since the increased cost of the iCub (around 200000 Euros) didn’t allow full support of the initially planned 8 awards. The announcement of the results was made on February 2nd, 2008 by email. Each principal investigator was contacted. Ranking The 10 best proposals are listed below. Ranking (numerical) was decided only for the first 10 best. Embodied cognition using internal simulation and a global workspace, Murray Shanahan, Imperial College London. Motor, affective and cognitive scaffolding for iCub, Olivier Sigaud, UPMC Paris. Development of shared intentions and cooperation in a humanoid robot via situated simulation models, Peter Ford Dominey, CNRS, Univ. Lumiere Lyon 2.
iCub development of kids' manipulation skills, Michael Beetz, TUM, Munich. An integrated anthropomorphic neuromorphic cognitive architecture for the iCub, Paul Verschure, UPF Barcelona. Emergence of communication in iCub through sensorimotor and social interaction, Erol Sahin, METU, Ankara. The role of sensorimotor function, associative memory and reinforcement learning in automatic acquisition of spoken language by an autonomous robot, Stephen Levinson, Univ. of Illinois at Urbana-Champaign. iDriver: the iCub as a humanoid robotic driver, Raul Rojas, Freie Universitaet, Berlin. Learning container/contents relations through observation and manipulation, Carme Torras, CSIC-UPC Barcelona. Embodied models of perceptual and social development and learning, Jochen Triesch, JW Goethe University, Frankfurt. Each evaluator received the 31 proposals, guidelines and evaluation forms with specific criteria to guide marking. A meeting was arranged in January 2008 to finalize decision and harmonize the scores of the evaluators. It was decided that the evaluation would happen by dividing the proposals in three classes: 1. Clear award, 2. Further evaluation required, 3. Clear reject. After the first round there were 4 clear award and 10 clear reject. Several rounds were required to reach the final decision. For the first 10 best proposals ranking was decided based on the evaluation. Each proposal received at least four evaluations. If possible, more iCubs might be awarded. The ranking will be used to determine the next best proposals. Robot number 7 was eventually awarded during the fifth period of the project. In case a winner gives up for any reason, the ranking will be used to determine another winner. It was also decided that each participant would receive a short evaluation report including scores and the evaluator comments. More details about the Open Call can be found here. Deliverable item D9.2 links with the relevant documentation of the summer school. The school website is online at: http://www.robotcub.org/summerschool. We hosted 38 participants this year from RobotCub, from the Open Call winners, associated EU projects and only a few from outside the Consortium. The 2009 Summer School was devoted to iCub programming only and two copies of the iCub and one head were available for 10 days without interruptions. Projects connected with RobotCub and the iCub. eMorph (Strep): a FET project building a camera that can fit into the iCub eyes. RoboSkin (Strep): developing a skin for the iCub. ImClever (IP): purchasing three full robots. ITALK (Strep): http://www.italkproject.eu: IIT built four iCub's for the ITALK project. There are plans to establish a funded network for exchanging researchers (with various research centres worldwide) - still under negotiation. 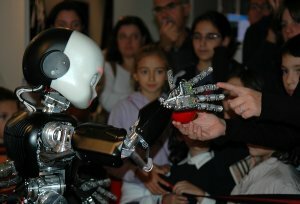 IIT is leading an activity to create a European Interest Group around the iCub (details are provided into the progress report. The legs of the I-Cub are going to be built for the German Humanoid Project in Karlsruhe (Prof. Rudiger Dillmann). These will be a modified version and they are going to work on bipedal locomotion (complementary to RobotCub). 4 robots are planned for the FP7 project ITALK, under negotiation. Interest has been shown by partners of the FP7 project CHRIS, under negotiation (head and upper torso). Interest has been shown by partners of the FP7 project Poeticon, under negotiation. One I-Cub head has been in Japan at the University of Tokyo with a student from the University of Genoa for approximately 5 months. The student has been working on topics of mutual interest with Prof. Yasuo Kuniyoshi. A quotation has been asked to the Coordinator for a copy of the I-Cub by Georgia Tech, US (Andrea Thomaz). Collaboration in vision software has been started with Ales Leonardis and his team in Lubjana, Slovenia. Contact has been made with various groups interested in developing infrastructure for humanoid robots (e.g. ATR, Japan; Karlsruhe, Germany; CMU, US). A special issue for the Robotics and Autonomous Systems Journal is in press which describes the current situation with robotic architectures (sort of state-of-the-art). This followed a workshop at the IEEE-RAS Humanoids 2006 conference in Genoa. The Open Call has been completed. The construction of the robots has been completed. The summer school was held at IIT in Genoa on 20-29th of July 2009. Participation was mostly (on purpose) limited to students already knowledgeable of the iCub. The school was important for fixing and improving the RobotCub standards, to communicate internally to RobotCub these standards, to present them to some of the 2006, 2007 and 2008 school participants. DARPA has contacted the Coordinator enquiring about the platform for their cognitive systems program. At IJCAI we had some discussion with DARPA on the idea of Open Source robotics. One student from TU-Delft has done his Masters Thesis at the University of Genoa specifically working on RobotCub. Giorgio Metta and Francesco Nori have visited the labs at ATR, Japan to discuss and plan specific issues related to humanoid robot control and software sharing with Gordon Cheng. The Research and Training Site has been started at IIT. This is instrumental to the training and support of groups willing to enter into the RobotCub community of users and to support the winners of the Open Call. The RTS has supported the training of one technician per group and the initial startup of the first iCub of the Open Call outside Genoa. Internationalization is work in progress. The measure of success of these activities is in the number of robots that are going to be built at the end of the project and in the new projects mentioned above. For the open source policy to be successful we have to be able to rely on a large user basis. This page was last edited on 29 June 2010, at 05:00.